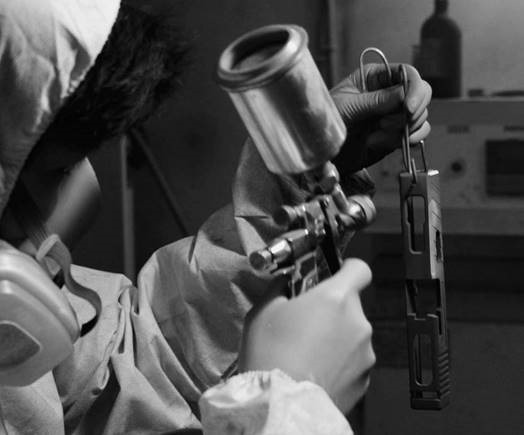 P18EVO was developed based upon WE G18C【GP617A】, using all the Poseidon’s patented upgrade parts and tens of labor hours to forge it. Let’s see if it’s worthy for a G18C fan to homemade it or at least, a part of it. Poseidon’s Cyclops Universal Combat Sights【PI011】with an extra orange kit. 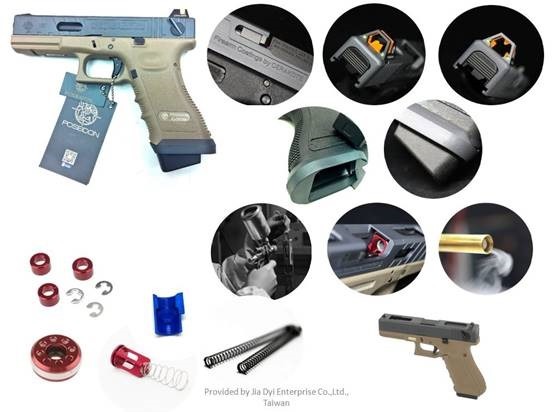 Magwell made by nylon plus fiber material【GLK-71】painted with Cerakote®. Poseidon’s Striker kits【PI015】which includes 97mm Air-cushion inner barrel,【PG003】, a grey two-stage 50 degree hopup bucking,【PH-G03】,and a CNC aluminum hop up chamber. If you think that’s all, you would surely miss the above labor work performed by 4 full-time experienced technicians in Poseidon. (please click the QA circle to see the custom service in You Tube). Except for the price of WE G18C was basically adopted from internet shops in competitive market, the MSRPs were provided by factories. Judging from the table, it costs an Airsoft amateur $282.39 to homemade an equivalent G18C, but still lacks of the unique appearance-Cerakote finishing, Deep and laser engraving, and most importantly, the Poseidon’s custom service! 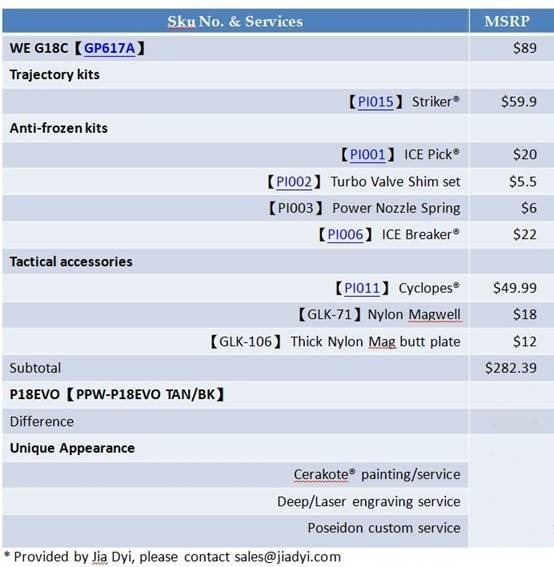 Wow…will the price of P18EVO skyrocket? Nah…..that’s not going to happen. What if I said they would demonstrate their capability in calibrating and the efficacy of upgrade parts rather than making profit from P18EVO? You might think they are insane. Contact your local Airsoft shops or Poseidon’s general dealer, Jia Dyi at sales@jiadyi.com , to know the jaw-dropping MSRP, and favorable wholesales prices for strategic partners.